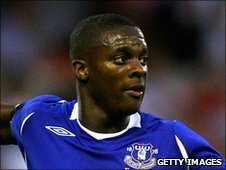 Peterborough United have signed Everton striker Kieran Agard on loan until the end of the season. The 21-year-old's only Premier League appearance came as an 89th-minute substitute in a 3-3 draw against Chelsea in December 2009. He has featured six times in total, starting one Europa League game. "We needed another striker, he comes very well recommended by [Everton boss] David Moyes," Posh manager Gary Johnson told the club website. "We think he is ready and mature enough to play at this level." A knee injury has restricted the former Arsenal youngster's football this season, but Johnson has no worries about his fitness. "Athletically and technically he will be fine for us," he added. "He is hard-working and has a decent touch and finish. "He is one of those players defenders need to keep an eye on." Agard has been cleared to play in Saturday's FA Cup tie at Fulham, while Leeds United have given permission for on-loan midfielder Adam Clayton to feature at Craven Cottage.